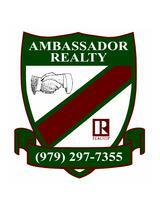 Whether you are new to the market, thinking of moving up, or you are an experienced investor, Ambassador Realty agents have the expertise, proven track record, and resources to help you buy, sell or lease your next home. Enthusiasm, knowledge of the area and personal concern for the clients interests combine to make us an outstanding resource for your real estate transaction. We work extensively to help Buyers and Sellers meet their real estate goals. We invite you to use this site to search for your next Single Family Home, Condominium, Townhouse, Land, Investment or Commercial real estate purchase. We encourage you to create your own free account, so that you may save listings that you might be interested in.